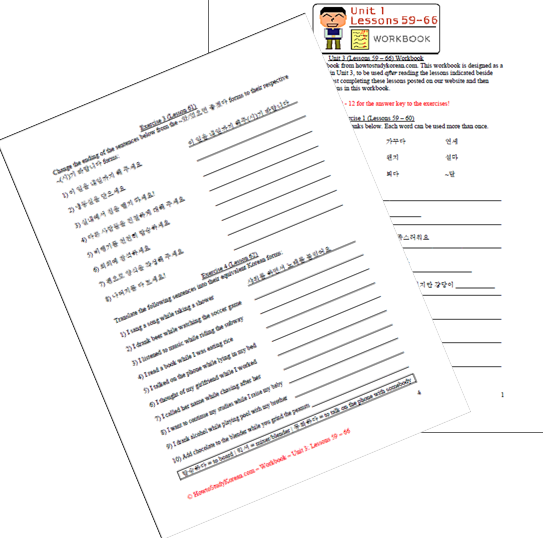 In addition to our lessons, we also offer supplemental Workbooks – where you can practice your Korean doing interesting and effective exercises relevant to what you learned in our Lessons. These workbooks are designed to be a supplement, to be used after reading individual lessons to help you practice and grasp what we teach. We have had a lot of feedback from our readers and they have all been asking us to add this to our list of things that we offer on this website. Although all of our lessons on our website are free, we have decided that we want to sell these workbooks to our readers for $5 each. 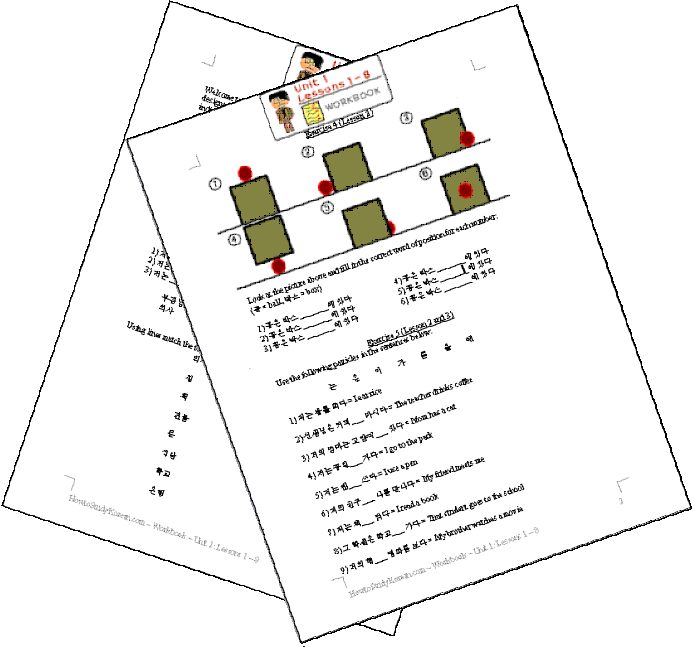 All of the Workbooks are PDF files that I personally e-mail to you. If you don’t like paying through Paypal, and you live in Korea, you could also send us the funds directly. 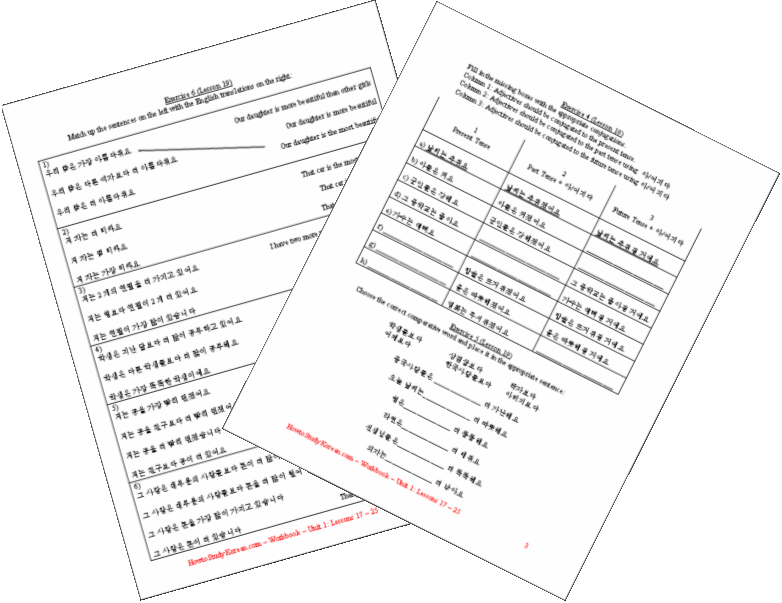 E-mail us at howtostudykorean@gmail.com for more information. 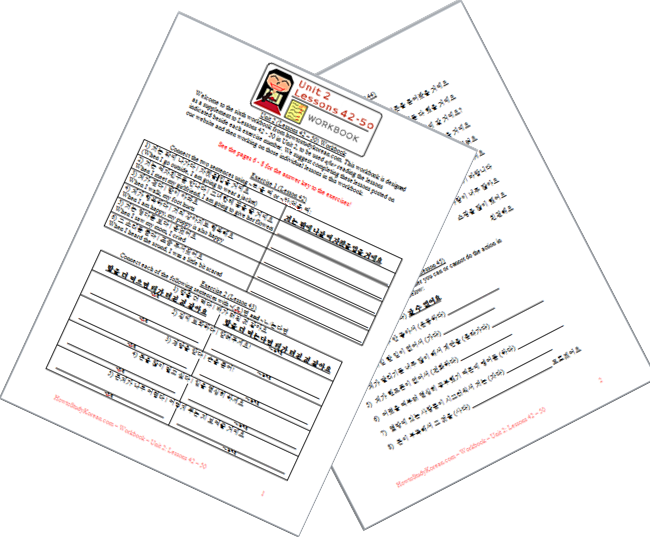 Use this Workbook to get all the practice you need in order to memorize all the letters in the Korean alphabet. Not only will you be able to memorize the alphabet, but you will also be able to properly read and write every letter after finishing this Workbook. In addition to this, you will be able to practice writing blocks of syllables and words using all the letters that you learned. Click the picture to the left to see an example of the first page of the Workbook (the full Workbook is 15 pages). 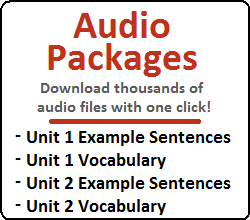 Click here to buy the Unit 0 Workbook. 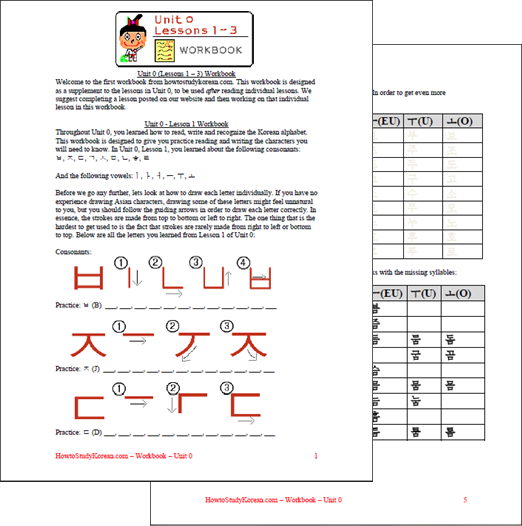 Use this Workbook to practice the basic Korean grammar you learned in the first eight lessons of Unit 1. Put your brain to the test by using the various words, particles and grammatical principles in a variety of different Korean grammar exercises. In addition to this, by using our exercises you will get practice reading, writing and understanding sentence structure and how to conjugate Korean verbs and adjectives correctly. There is also an answer key so you can check your answers to all of your completed exercises! Click the picture to the right to see an example of the first pages of the Workbook (the full Workbook is 20 pages). Click here to buy the Unit 1: Lessons 1 – 8 Workbook. Us e this Workbook to get real life practice using the concepts you learned in Lessons 9 -16 of Unit 1! Start out by getting tons of practice using 이다 in a variety of different exercises. 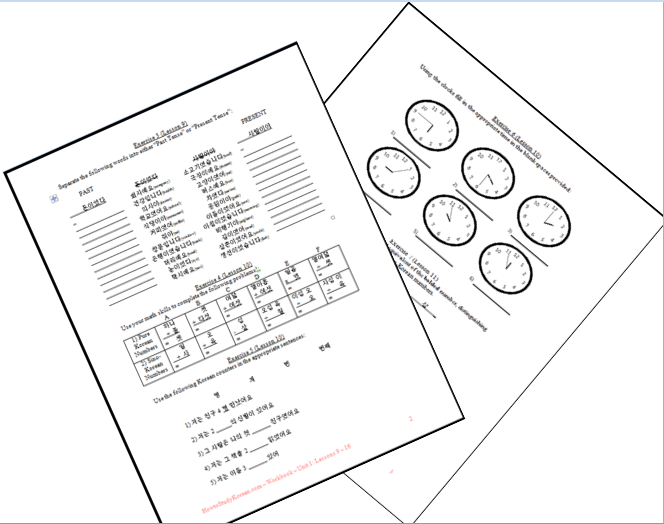 You will then be able to practice reading, writing and recognizing numbers and descriptions of time using exercises in Korean that you can apply directly to real life! 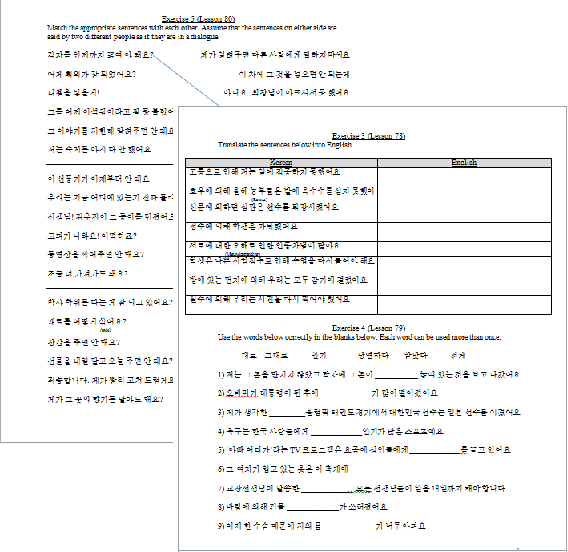 Following that, you can practice all of the confusing Korean particles and words you learned throughout Lessons 9-16. As with the previous Workbook, there is an answer key where you can check your answers on all of your completed exercises. Click the picture to the left to see an example of some of pages in the Workbook (the full Workbook is 16 pages)! Click here to buy the Unit 1: Lessons 9 – 16 Workbook. Use this Workbook to get tons of practice using the concepts you learned in Lessons 17 – 25. 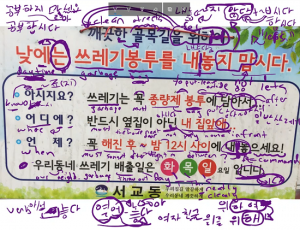 Start off by practicing the correct usage of various connecting and ending grammatical principles, including ~고, ~고 싶다, ~고 있다, and ~아/어지 다. Following that, you will find a variety of exercises where you can practice comparative and superlative sentences (using 더, 보다, 가장), and the confusing usages of 잘, 잘하다, 못, 못하다, and ~지 못하다. 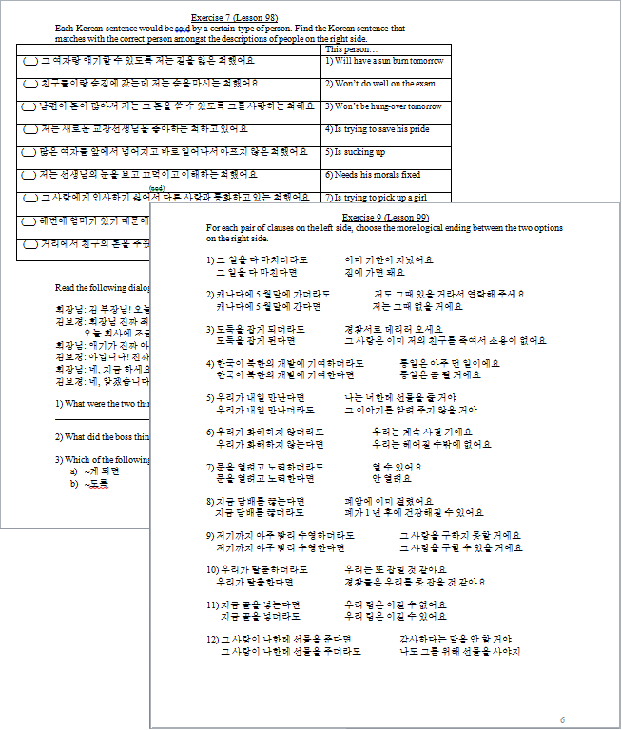 You will then be able to practice making sentences using question words and practice making clauses using 전 and 후. Finally, you will practice using all the confusing “some—, every—, any—, no—” words! As with the previous Workbooks, there is an answer key where you can check your answers on all of your completed exercises. Click the picture to the right to see an example of some of pages in the Workbook (the full Workbook is 17 pages)! Click here to buy the Unit 1: Lessons 17 – 25 Workbook. Here we go! With our first Workbook in Unit 2, you can practice everything that you learned in Lessons 26 to 33! 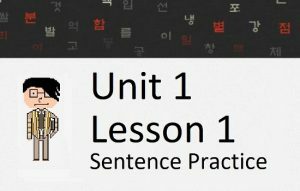 Start off with a variety of exercises allowing you to better your understanding of the ~는 것 principle. Everything including simple ~는 것 sentences, using ~는 것 in the past and future tenses, ~는 것 irregulars, and the common nouns that often replace “것” (지, 중, 적, etc…). In addition, you will be able to practice making your own sentences using the principles discussed in these eight lessons. Of course, an answer key is provided. Click the picture to the left to see an example of some of the pages in the Workbook (the full Workbook is 13 pages). Now we are starting to get a little bit more difficult! In this Workbook, you will be able to practice all the concepts that you learned in Lessons 34 – 41. Start out by constructing sentences using the difficult words presented in Lesson 34 and using the ~ㄹ 것 같다 principle presented in Lesson 35. Following that, you will better understand how to say “because/therefore” in Korean by practicing the correct usage of ~아/어서 and ~기 때문에 in sentences. Finally, you will practice creating imperative sentences and using the honorific ~(으)시 ending. As with all Workbooks, an answer key is provided. 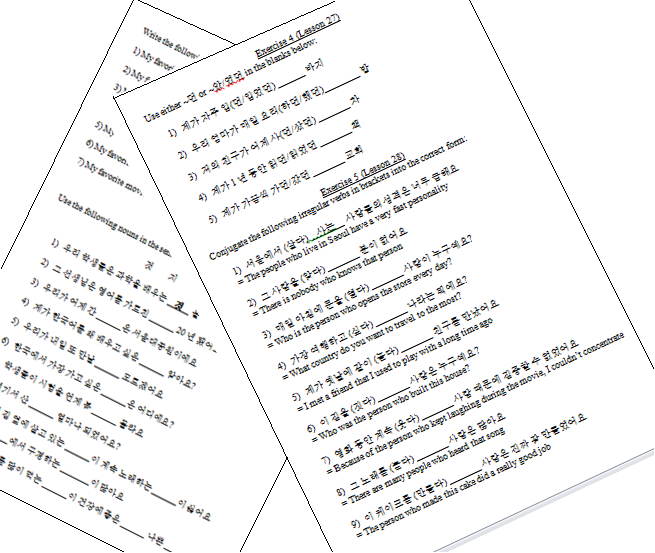 Click the picture to the right to see an example of some of the pages in the Workbook (the full Workbook is 13 pages). Now that you have reached these higher (more difficult) lessons, your understanding of Korean grammar should be very good. What you need now is practice using the variety of sentence-connecting and sentence-ending grammatical principles to make your sentences more complex. 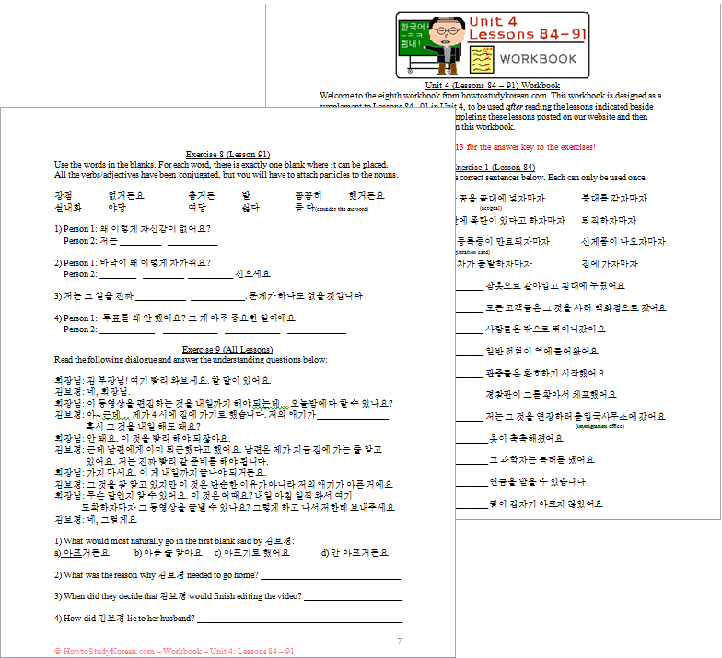 In this Workbook, you will be able to practice connecting two clauses by saying “if” and “when” using ~(으)면, ~ㄴ/는다면 and ~ㄹ/을 때. Following that, you will practice using the sentence-ending grammatical principles: ~ㄹ/을 수 있다/없다, ~아/어 야 하다, ~ㄹ/을 필요가 없다 and ~아/어도 되다. In addition, the final exercise allows you to practice all the concepts you learned up to this point. Again, an answer key is provided. 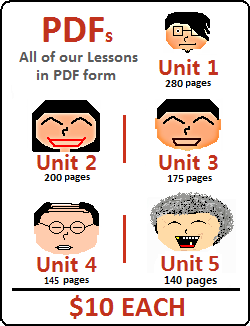 Click the picture to the left to see an example of some of the pages in the Workbook (the full Workbook is 16 pages). Now it’s time to really get serious. Get ready to practice all the grammatical principles you learned in Lessons 51 to 58. 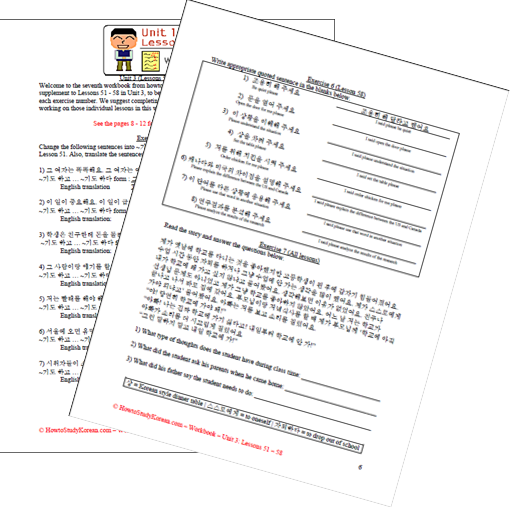 A lot of these lessons were centered on quoting in Korean – so you can be sure you will be getting lots of practice making proper quotes sentences in this Workbook. In addition to that, you will be able to practice how to use things like ~기도하고… ~기도하다, ~거나, ~(이)나 and ~게. In this Workbook, you can get more practice using the grammatical principles you learned in Lessons 59 – 66. Not only will you be able to practice the difficult words you learned at the beginning of these eight lessons, but you will also get practice using ~았/었으면 좋겠다, ~기 바랍니다 and ~(으)면서. Of course, you will also get more practice distinguishing amongst the various usages of ~까(요). In this Workbook, you can apply the knowledge of the grammatical principles you learned in Lessons 67 – 75. Tons of grammatical principles in these lessons – all of which are important to master before you embark on Unit 4. Get practice using: ~듯, ~처럼, 유일하다, ~아/어, 제외하다, 포함하다, 만큼, 정도, 대신, 상관없다 and 신경 안 쓰다! You thought Unit 3 was hard? Get ready to practice the difficult (and natural!) grammar that you learned in Lessons 76 to 83. Of course, you will get practice using ~는데, because Lessons 76 and 77 were dedicated to that. Following that, you will to practice using ~에 의해 and ~(으)로 인해, and the difficult words you learned in Lesson 79. In addition, you will be able to practice using things like 되다, ~아/어서는 안 되다, ~(으)면 안 되다, ~(으)니, ~(으)니까, ~구나, ~군, ~군요 and ~네(요). In this Workbook, you can get more practice using the grammatical principles you learned in Lessons 84 – 91. You will be able to practice using ~자마자, 줄 알다/모르다, 아니라, ~기로 하다, fractions, ~잖다 and the many meanings of ~다가 and ~거든. In this Workbook, you can apply the knowledge of the grammatical principles you learned in Lessons 92 – 100. Lots of stuff in these lessons – all of which are important to understand before you start with Unit 5. Get practice using: ~도록, ~지/죠, ~게 되다, 뿐, 뿐만 아니라, ~(으)려면, ~는 척하다, and the many meanings of 텐데. No need for the lengthy explanation. The Workbooks in Unit 5 are designed to give you practice dealing with the grammatical principles introduced in our Unit 5 Lessons. Of course, all of exercises have solutions (with translations to English). 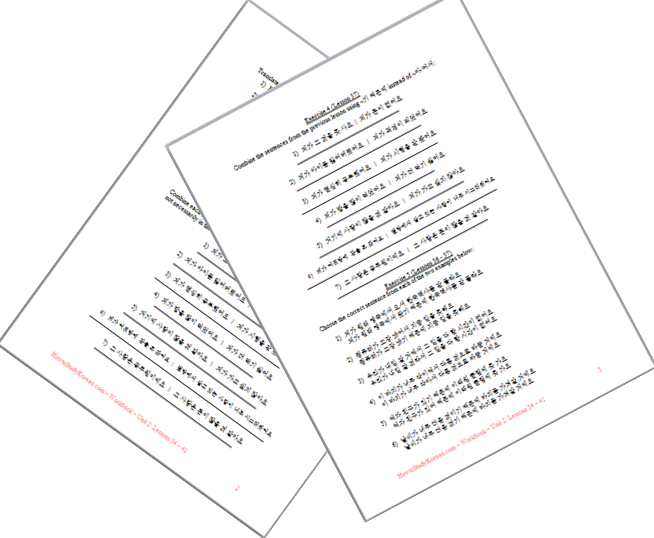 Workbooks for later lessons will be uploaded as they come out! If you ever have any questions, don’t hesitate to contact me.